FAQ — St. Louis Board Game Bar and Cafe - Pieces STL, LLC. + what do you offer? Pieces has a Board Game Library of over 800+ games, tasty cuisine, and a full bar with alcoholic and non-alcoholic selections. Our "Game Navigators" are familiar with a vast majority of the Library and are always available to suggest a game, explain rules, help with set-up, and assist you throughout your game. Game Navigators also provide you with full table service for your food and drink needs. + Do you cater to vegans, vegetarians, gluten-free, and other dietary concerns? ABSOLUTELY! Our cuisine is designed to cater to ALL palettes. Because our guests come to Pieces for the board games, it is one of our main priorities to offer a menu that pleases a diverse crowd. The vast majority of our food is made in-house from scratch and can be tweeked to accommodate most every dietary need. When ordering, alert your Game Navigator to dietary preferences and our chefs will honor your requests. + Can I bring outside food & drink? We also do not permit outside drinks simply because we allow guests under the age of 21 to enter and game. As a result, we need to provide and serve all beverages to ensure there are no instances of underage drinking. + What is a library fee? There is a $5.00 Library Fee per person to access our 800+ game library. To make it affordable, we do reduce the Library Fee by $1.00 for every item you purchase. For example, you have 3 beers and 1 food item, your individual Library Fee will be reduced to $1.00. We spend 100% of these fees on library maintenance. The fee is used to refurbish games as boards and cards are subjected to inevitable party fouls, replace lost pieces, obtain card protectors for our most popular games, and to purchase new games every month. The Library Fee grants you access to play as many games as you want and you're also welcome to stay as long as you want. Library Fees for children under 12 years of age are WAIVED. + Do you have to be 21 to enter? Not at all! We only ID guests who wish to order an alcoholic beverage. We encourage families and friends of all ages to visit us. High chairs and a kids game library are available. A Helpful Tip for Parents Visiting us on Weekend Evenings: We tend to go on a wait for tables on Fridays and Saturdays around 7pm. Thus, we encourage families with young games to arrive earlier. We know young ones can get a little antsy when waiting for a table or food! It is extremely rare for us to go on a wait for tables on weekday evenings or weekend mornings/afternoons. + what if my friends are busy? Fear not lone wolf, we’ve got a variety of single-player games and would love to teach you how to play them! Or feel free to come in and sit at our bar and hang out. Our bartenders are always looking for someone to play a light game with! + do you have a happy hour? Yes! Every Tuesday through Friday 4pm to 6pm. Includes $1.00 off beer, cocktails, wine, and appetizers. If you want to plan a corporate happy hour at Pieces, we do offer extended happy hour prices. Contact us at info@stlpieces.com for details. + do you sell gift cards? Stop by Pieces during any normal business hours and feel free to purchase a Gift Card in any denomination! Or order your eGift Card today without having to drive to Pieces! Identify your recipient, your recipient's email address, and your gift is sent instantly! Great for last minute gifts. + How do I reserve the private room? Please fill out the contact form available under "Private Room" on this website. For groups that would like to use the space on a regular basis (i.e., every Thursday night or every other Thursday night), or for parties and events, please contact us and we will work with you to make your dreams come true! + can I bring in my own game? We do not permit outside games as it would be extremely difficult for staff to keep track of Pieces-owned games and customer-owned games. We provide one exception: our Private Rooms! This is to allow regular gaming groups the opportunity to bring in their own game(s) without the expense of a Library Fee. If, however, you would like to use the Pieces Library while reserving the Private Room, a Library Fee will be applied to each player. + can I schedule my private event at pieces? You sure can! We welcome groups to utilize our space for charity events, work team building sessions, and parties! Please contact us at info@STLpieces.com for details and scheduling! We plan custom events for every group! + why am I here on this planet? I really can only think of three reasons: (1) watch YouTube videos of cats knocking things off counters; (2) laughing until your stomach hurts; and (3) and enjoying time spent with the ones we love. If you can think of other reasons, then you’ve pretty much made it life. *Brunch served on Saturday & Sunday from 10am to 2pm. * Kitchen closes one hour prior to closing. Pieces can open early or on Mondays for private parties. Email info@stlpieces.com for details! We are Walk-In Only. Read Below for Further Information. Due to the board game concept, we do not take reservations in our main gaming/dining room because it is difficult to predict when a certain sized table will be available. Some guests may come in to play one quick game, while others may play numerous selections for a couple of hours. We do, however, take pre-reservations for our separate private party rooms. (These rooms tend to book up two weeks in advance on weekends and one week in advance on weekdays). Fill out the contact form on this website to inquire about availability! Because Pieces is primarily walk-in only, we highly recommend utilizing the free "Yelp" app that you can download on your phone. You can search "Pieces" and if we are on a wait you can jump in line remotely. Be sure to refresh the App when you are checking to see if we are on a wait. PLEASE IGNORE ESTIMATED WAIT TIMES. The board game concept does not lend itself to accurate wait times. When you get in line, please head over so you are prepared to be seated earlier than expected. If the wait time is longer, we have a bar where you can order drinks and food while you wait. Pieces is surrounded by metered parking. The City of St. Louis meters until 7pm on the street. There is a large 24-hour parking lot across the street from Pieces. This lot is run by the City and costs $1 per hour. 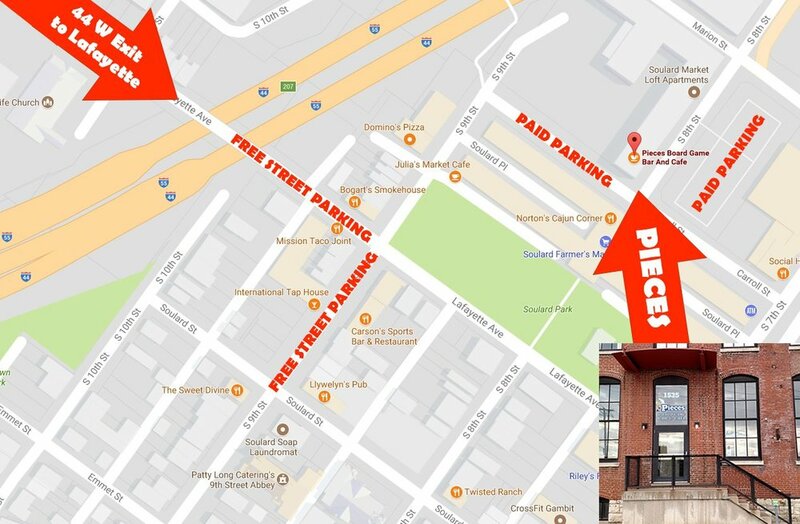 There is free street parking on S. 9th Street and Lafayette Avenue (three blocks from our location). When you arrive, call us at (314) 230-5184. Our Host will come outside and direct you to the correct entrance, which contains a wheelchair lift (not a ramp).